With big men Jasper Moedt and Franco Kouagnia at their bruising best on Friday evening in Prince George, the paint wasn’t a pleasant place to be. Moedt, the stalwart 6’7” fifth-year centre with the University of the Fraser Valley men’s basketball team, paced his squad with 22 points and hauled in a game-high 14 rebounds as the Cascades claimed a hard-fought 77-71 road win. His UNBC counterpart Kouagnia (also 6’7”) more than lived up to his end of the bargain in a battle of elite centres, racking up a game-high 26 points and snaring 12 boards. “Jasper just battled so hard,” Cascades head coach Adam Friesen said afterward. “He took care of the rebounding aspect of things – he’s just a monster down there. And he was so efficient offensively. The CIS No. 9-ranked Cascades, coming off their first conference loss since November 2013 – a 74-72 setback against the Mount Royal Cougars last Sunday – came blazing out of the gates on a 16-4 run, highlighted by a steal and breakaway dunk by Kadeem Willis and three-pointers by Manny Dulay and Dominque Brooks. UFV maintained a lead in the neighbourhood of 10 points for much of the evening, but UNBC made a push late in the third quarter and cut the deficit to 63-60 early in the fourth. But the Cascades responded with an 11-4 spurt, capped by a Vijay Dhillon triple, to boost the lead to 74-64 and they kept the T-Wolves at bay from there. Perhaps the most remarkable element of Moedt’s sparkling 10-for-16 shooting performance from the field was the fact he confidently nailed both of his attempts from beyond the arc. Both came in high-leverage situations in the second half. Moedt, a second team Canada West all-star last season, leads the conference in rebounding at 10.9 per game. Kevon Parchment (16 points), Brooks (13), Dhillon (11) and Kadeem Willis (10) also scored in double figures for the Cascades, who shot 53.8 per cent from the field as a team, including 8-for-13 from beyond the arc (61.5 per cent). The Explorer Division-leading Cascades improved to 16-1 on the season, while the T-Wolves fell to 9-8. They’re tied for second with the Thompson Rivers WolfPack, with Mount Royal (8-9) lurking in fourth place. 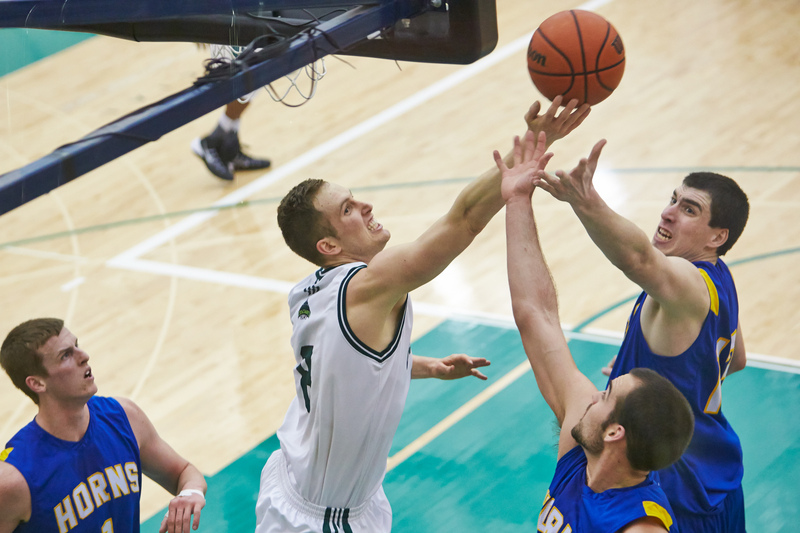 UFV and UNBC lock horns again in Prince George on Saturday (7:25 p.m., webcast at ufv.canadawest.tv).